Other than shopping by age, size and experience, you have three options when selecting your horse: mare, gelding or stallion. A mare is a female horse. Geldings and stallions are both boys, the difference being that geldings have been castrated -- the testicles necessary for breeding have been surgically removed. Regardless of generalities ascribed to each type of horse, remember they are individuals and there are always exceptions. If someone tells you that her female horse acts “mare-ish,” she is saying the horse has an attitude -- usually that she wants to do things her way, on her terms. Keep in mind that her way may not be unreasonable; in the pasture, she may be protecting a young horse from a bully. Under saddle, she may be protecting you from trying something you’re not ready to try, like jump a big jump before your position is stable, or going down a trail that she knows will be difficult to navigate. Many competitors covet mares specifically for this attitude. When your mare is in estrus, or heat, it means her body is preparing to be bred. This will usually begin in the spring and continue until fall, and during this time she can go into heat every few weeks. Some mares weather this process easily, with no physical discomfort, while others become very sensitive and uncomfortable. You won’t know how it affects any mare unless a previous owner tells you, or until you’ve had her for a few of those months. Some horse owners don’t want to deal with this potential sensitivity, while others work with veterinarians to interrupt the heat cycle with injections to prevent it. Stallions are intact, meaning they have their testicles and all of the hormones telling them one thing: they were meant to breed mares. The instinct is natural and very strong, and getting them to focus on something else is difficult and requires very experienced handlers and riders. Their testosterone levels can also cause aggressive behavior toward other horses, people and surroundings. There are many well-behaved stallions showing in competitions, but in addition to good breeding, they were typically handled properly and continuously throughout their lives. Even so, all that training and handling can be forgotten when a mare in heat walks by. Because castration removes the testicles and the testosterone they produce, and they don’t have the monthly heat cycles of mares, geldings are generally considered the most even tempered and mild mannered of horse types. 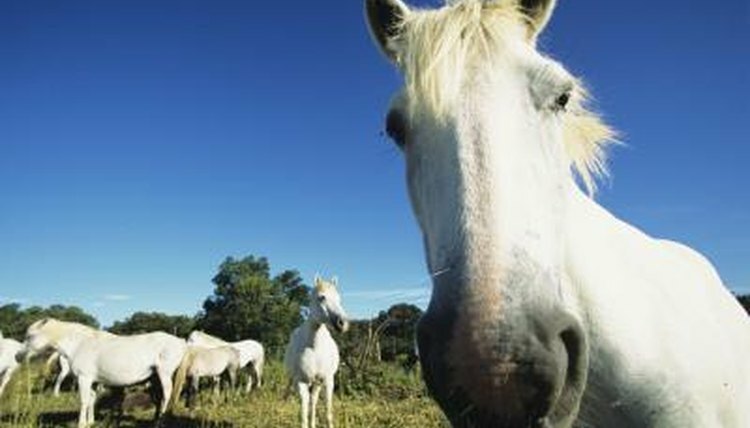 However, some geldings still exhibit “studdish” or stallion-like behavior; this may just be their inherited personality. Also, a recently gelded horse will still have testosterone levels for several weeks and could still impregnate a mare. Finally, a cryptorchid is a gelding that has at least one remaining testicle that did not drop down into the scrotum. He may not be fertile, but he's still producing testosterone that can cause aggression. Why Won't a Horse Stand Still During Saddling?